Space Harrier (スペースハリアー, Supēsu Hariā?) is a third-person rail shooter video game released by Sega in 1985. It spawned several sequels like Space Harrier 3-D (1988), Space Harrier II (1988), or the spin-off Planet Harriers (2000). It was originally made for the arcades, and later saw ports to many home game systems. Running on the Sega Space Harrier arcade system board previously used by Hang-On, the pseudo-3D sprite/tile scaling in the game was handled in a similar manner to textures in later texture-mapped polygonal 3D games of the 1990s. Designed by Sega AM2's Yu Suzuki, he stated that his "designs were always 3D from the beginning. All the calculations in the system were 3D, even from Hang-On. I calculated the position, scale, and zoom rate in 3D and converted it backwards to 2D. So I was always thinking in 3D." Gameplay of Space Harrier as the player is seen fighting what appears to be a cyclops mammoth. The arcade version of Space Harrier uses digitized voices. When starting the first level, for example, the player is greeted with "Welcome to the fantasy zone; Get ready". After defeating a boss, the player is assured that "You're doing great". Like After Burner, Space Harrier was among the first (perhaps the very first) arcade game to feature a console in which the player sits, and which moves according to the joystick movement. There is also a non-moving sit-down version and a standard upright version. The arcade version has a total of 18 levels, each containing a boss at the end. Three exceptions are the bonus levels (5th and 12th), and the 18th level, which is a boss rush containing some of the bosses encountered up to that point. Some versions of Space Harrier, however, including the Sega Master System,  Sega Game Gear, and Nintendo Famicom versions, feature a unique final boss called Haya Oh, a fast and powerful fire dragon with twin bodies. The 3-D Battles of World Runner by Square bears a strong resemblance to the game. The game was translated to various home computer systems and consoles. Among the home versions, the ports for the Sega 32X, with Space Harrier packaging art by Marc Ericksen for U.S. and European distribution (not shown), the Sega Saturn and the Sharp X68000 (the latter being a Japan-only) are considered to be the most faithful to the original arcade version. The game is also playable on the Dreamcast (within Shenmue, Shenmue II and Yu Suzuki Game Works Vol. 1) and Xbox (within Shenmue II). It is included in Sega Arcade Gallery for the Game Boy Advance and the enhanced Japanese Sega Ages vol.4 PS2 remake is included in the Eur/NA Sega Classics Collection (a compilation DVD including other games from the same era that were remade for modern audiences) for the PlayStation 2. The art for the 1994 Sega 32X and the Game Boy Advance release in North America and Europe (not shown) featured full color art by illustrator Marc Ericksen. Space Harrier II for the Mega Drive was released for Nintendo's Virtual Console on December 18, 2006 while the first Space Harrier for the Sega Master System was released in Europe on October 17, 2008 and in North America on November 3, 2008. The arcade version was released on the Virtual Console in Japan on March 26, 2009, in the PAL regions on May 29, 2009 and in North America on June 15, 2009. The arcade version of Space Harrier is available as an unlockable game in Sonic's Ultimate Genesis Collection, released for the Xbox 360 and PlayStation 3 consoles. While the port's emulation is accurate to the arcade original, there are off-pitch voices and music in the port's sound emulation. A port of the game was developed for Nintendo 3DS via the Nintendo eShop, featuring stereoscopic 3D and widescreen graphics. Sega Superstars Tennis features a minigame based on Space Harrier. Bayonetta also features a level section inspired by the game as well. The main theme of the game is remixed for Sonic & All-Stars Racing Transformed and used as the soundtrack for the course Race of AGES, a track that is a representative of Sega as a whole. The game also features Ryo Hazuki from Shenmue as a playable character, driving a Space Harrier sit-down arcade cabinet during air-based portions of a race. Space Harrier Complete Collection includes the arcade version of Space Harrier and Space Harrier II, the Sega Master System version of Space Harrier, and Space Harrier 3-D. Also included as an Easter egg is the Game Gear version of the game. It was released for the PlayStation 2 as the 20th volume of Sega Ages. 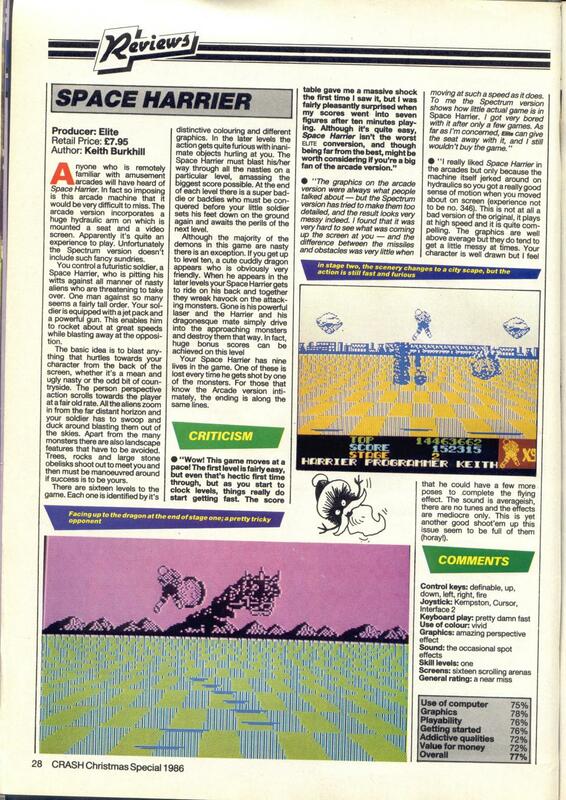 Computer Gaming World reviewed the Sega Master System version in 1988 and called Space Harrier "the best arcade shoot-'em-up of the year ... as exciting a game as this reviewer has ever played". The game was runner-up (described by Computer + Video Games magazine as commended) in the category of Game of the Year at the 1986 Golden Joystick Awards. Reviewing the 32X version, GamePro commented that, though Space Harrier is an old game, it has straightforward controls, solid sound, graphics that are closer to the arcade version than any previous port, and is also free of the slowdown and sprite flicker which hampered the action on previous ports. They concluded the game to be "a nice trip down memory lane" and scored it 4 out of 5. This page was last modified on 10 December 2015, at 23:44.